Airport commissioners hopeful samples come back negative. As part of the ongoing reconstruction of runway 06/24 — Martha’s Vineyard Airport’s 5,504-foot primary runway — excess soil from the project must be tested for the presence of per- and polyfluoroalkyl substances (PFAS) before it can be properly disposed of, airport commissioners were told at a meeting Thursday. Commissioners approved a work order not to exceed $14,200 to pay for Tetra Tech, the environmental engineering company overseeing the testing for the airport, to test the stockpile of soil from the reconstruction of the existing runway. O’Brien said MassDEP approved the removal of asphalt and other materials from the worksite, but placed restrictions on how excess soil would be removed and disposed of, based on whether or not PFAS was found. “The soil is currently being stockpiled and covered with sheeting. If this work order is approved, we can have Tetra Tech go out and test the soil for us,” O’Brien said. He said there is no indication that the soil has chemicals in it, but the airport is being cautious in presuming that it might. O’Brien said the soil samples will take two weeks to test and yield results. Ron Myrick of Tetra Tech has already taken samples and, according to O’Brien, is anticipating approval by the state. Myrick told The Times that 5 additional monitoring wells are being put in to test for the presence of PFAS. Of the 5 monitoring wells, 2 of them are located approximate to the location of a 2011 boat fire in the Airport Business Park, Myrick said. The rest will be located across the Edgartown-West Tisbury Road, north of the original study area, where a small amount of firefighting foam was used to put out an aircraft fire in 1996. In other business, commissioners approved a $29,979 purchase of a state-of-the-art fire truck nozzle fitting that will allow the airport to test their firefighting foam without expelling it outside the truck. Airport director Ann Richart told commissioners that the new Oshkosh Eco EFP fitting requires zero foam on the ground for testing foam-chemical percentage, along with how well the foam flows through the hose. The new smart nozzle archives test data for three years, includes time and date stamps for easy reference, and allows data to be downloaded onto a USB drive. Of the three FAA-approved nozzle systems, the one Richart suggested choosing, the Oshkosh, is compatible with the new Oshkosh fire truck commissioners approved in December. Richart said she expects the truck and fitting to arrive on-Island sometime in September. Assistant airport manager Geoff Freeman gave an update on the status of the runway reconstruction project. He said that by the end of next week, he hopes to lay the first patches of asphalt for the runway, and close it to all air traffic except helicopters on April 9 through 11. 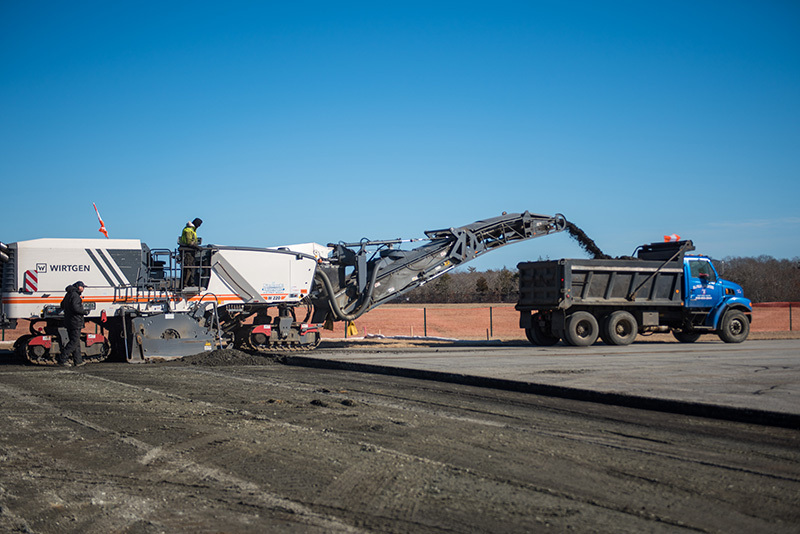 The target date for opening the runway to all air traffic is May 15, although some finishing touches will continue to be ongoing after the resurfacing is complete, such as painting and grooving of asphalt.